The trip is far from Sharm el Sheikh 220 km by jeep cars. The place for the trip is high from the sea around 1000 m... It is not hot in summer and not could in winter because of High Mountain. 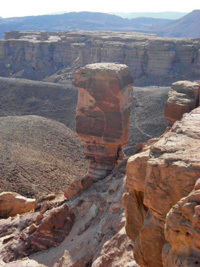 There is the Lost Land area with the Big Coral canyon. 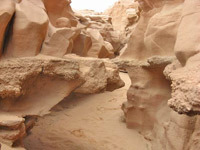 Coral canyon is the place where was the sea from millions years ago. 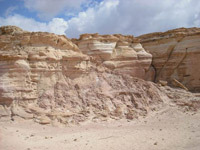 The canyon contains high dunes of wet sand and very pure and beautiful like the view from the Fairy-Tails of the Middle East, it is the untique rocks, hills, mountains, caves. There are the very high long mountains - stele, the color caves with the corals, the tunnel - 50 meters inside the mountains. Very big wet desert is very high and very pure. Of course the canyon is a new idea and nobody had there trips before us so...no superscriptions and drawing on the mountain walls. There are very clean walls. In this place was the sea from millions years and now here many marks of the sea (shells and corals). 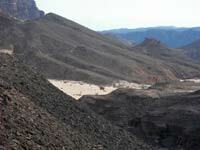 In this canyon there are some very old pictures from the roman time in Egypt. There are steles from the rocks; there are the stones, which look like animals and layer-cakes. There are also the place where the people was stopping for the first rest, when they was parking as the ihrams (pilgrimage to Mecca) from Egypt in middle age time and the place full by history, beauty, fresh and pure natural. Before the trip inside the canyon, we invite you to drink some Bedouin tea in the Bedouin tent with nice atmosphere. The canyon trip is 2 hours for 3 km. After the finish of the canyon you are moveing 11 km to the hotel Salah el Dian in Taba by jeep to have the rest on the beach in the privet place. 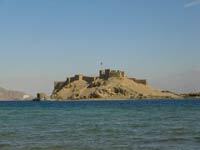 You`ll get for free towels and chaise-lounge and you can swim in the red in the national park Salah el Dian for one hour. The soft music all the time sound on the beach. You`ll get tow rooms, one room for women and one room for men to change your clothes, and takes the shower before lunch. The lunch is with the view of Salah el Dian castle. This castle built from 1000 years ago. The restaurant has the view also for 3 cities (Taba, Elat, Akaba) and 3 countries. Around the restaurant are the green area and many palms. The lunch includes the chicken, meat, fish, rice, salad, one soft drink or the small water. 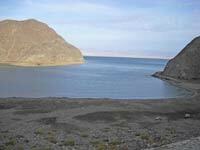 Then you`ll move for 3 km to catch last stop in the fiord area (el fiord national park). The magical place between the mountains is full of very beautiful corals. This is the national park for our divers. There are the sandy places like the sand beaches. Here better to have the coral shoes. You`ll swim here for one hour. This is the last point of the trip, now only the returning to Sharm el Sheikh. Total time of the trip is around 5 hours.